The Carthay Circle Theater in Hollywood is the spot where Snow White and the Seven Dwarfs debuted in 1937. This historic film was the first full-length animated feature created by the Disney company. 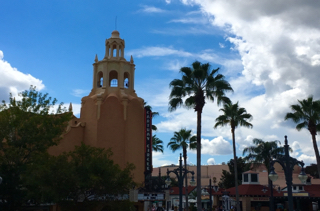 Hollywood Studios pays tribute to that building in the Sunset Boulevard area of the park. The "Once Upon a Time" store is located here. I took this shot today while waiting for my tour guests, who were enjoying the Beauty and the Beast show nearby.